It seems as though everyone's favorite topic these days is 'going green' and perhaps one of the most obvious associations we have with the idea of green living is solar energy. But how realistic, easy or affordable is this option in a residential application? Is there really any environmental or economic benefit to the inclusion of solar panels into your home's energy plan? The simple answer is; that depends. Here are some of the things it depends on! The reality is that solar energy can be a very positive addition to your home, under the right circumstances. There are a lot of options for not only offsetting the costs, but also for methods of evaluating and implementing alternative energy into your lifestyle. Here are some of the questions to answer before signing up or ruling it out. Do you rent or own your home? If you own, are there specific guidelines in your HOA about whether or not you can install solar panels? Even if there isn't a specific line item for solar panels, you might consider that your neighbors might have an opinion anyway. It never hurts to talk to them before installing a solar array. At least this way, you know what reaction to expect form them. If you're not sure about your HOA's guidelines, here is a handy resource of HOA documents for many of the communities in the greater Indianapolis area. Are you planning to stay where you are for a while? Installing a system which would make a substantial impact over time requires just that....time. There are options for renting solar panels as well, which decreases some of the upfront cost. Analyze your current energy picture. What size is your home and what are you spending now? Does it make more sense to change your method of energy, or just be more mindful about your consumption? There are companies which will come and help you evaluate your current energy use, or you can use this phenomenal calculator to estimate what your current use is. I actually found this tool pretty eye opening even aside from it’s usefulness in considering energy options. It will show you just about every graph and report you could hope to have about the make-up of your specific energy lifestyle. Location and exposure. If your roof is in full shade, that's going to put a crimp in the plans. You'll either need to have a large enough lot to install a ground or raised array or consider whether trees can be removed or scrap the idea altogether. The exposure of your home matters, as well. It doesn't necessarily have to be just a Southern exposure, but certainly some exposures are going to provide better value than others. Being in Indiana is another thing to consider, given that we have several months of gray winter, but it’s not a deal breaker. Here is a map that shows the energy potential by area. If you are a good candidate for solar energy, but are unsure of or daunted by costs, there may be more options than you might think for making it affordable. 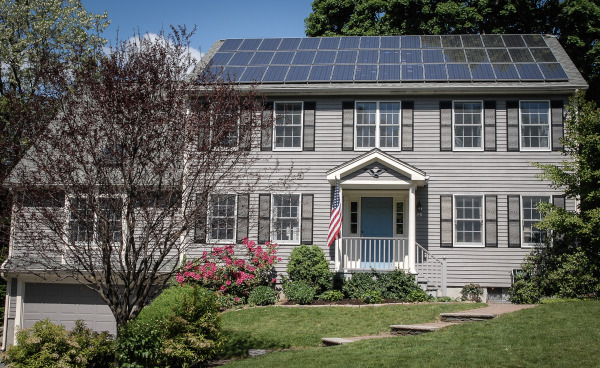 You should understand that the out-of-the-box cost for installing a solar system which would be able to provide enough power to replace what your home is currently receiving from the power company is not small. However, if you determined in your evaluation that you could ultimately save money on your energy costs, even if you paid that un- discounted price, it's a little like the concept of rent vs. own. There is no end to paying the power company, but with solar panels, at some point, you've more than paid for the cost of installation and now you're money ahead every month, while also making a positive impact (or lack thereof) on the environment. Utility Incentives Net Metering Programs. What happens here is that the grid basically pays you for producing energy. This works like a credit toward your bill and some people have even made money on the deal. Not a huge amount for a general, residential array. But money in is generally better than money out even if it's only a few dollars! Some of the power companies who participate in this sort of program are Duke Energy, Indiana Michigan and Power Company (I&M), Indianapolis Power and Light (IPL), Northern Indiana Public Service Company(NIPSCO), and Vectren. Solar Energy Rebates: According to Indiana's Office of Energy Development; "IPL offers a "Small-Scale Renewable Energy Incentive Program" to both residential and small to medium- sized commercial and industrial customers. The program will provide incentive payments of up to $4,000 per system"
State and Federal Tax Credits. There are actually several state and federal tax credits which offset the upfront cost of a system. For example, one credit allows your panel system to be exempt from affecting your property taxes. Another offers a credit for up to $4,000 for making the switch. There are also several grants which can be obtained. The truth is that alternative energy for your home is no longer so far fetched as it may have been just a few short years ago. In the UK, the government is trying to move all of its residential areas toward being individually solar powered, and it's now becoming a desirable feature for resale to have a panel system already installed. Whether you have never thought of using solar power or you’ve always been intrigued by the environmental and economic potential, hopefully this will be a helpful outline for your consideration . You can find more information and resources about this topic here.